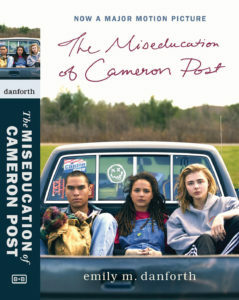 This past summer, The Miseducation of Cameron Post was released as a feature film and received the Grand Jury Prize at the Sundance Film Festival. After seeing the film and enjoying it so much, I was eager to read the young adult novel it was based on. True to form, the book is a much deeper exploration of a queer teen’s coming of age in Montana, and the ending is especially moving as a rite of passage into one’s chosen family. To paraphrase Toni Morrison, we must write the books we want to read, and certainly Emily Danforth has written a book that many queer teens will want to and need to read. Come to find out that Emily had taken the SpeakOUT training with her wife this past February. Inquiries were made, and after getting back from touring with the film, Emily agreed to answer some questions for the SpeakOUT audience. Ellyn Ruthstrom: I know you grew up in Montana during the 90s, so you know the area of the country and the timeframe you wrote about very well. What did you want to capture about the location and time period when you were writing the novel? Emily Danforth: Montana has such a rich literary history, from Ivan Doig to Debra Magpie Earling, Norman MacLean to William Kittredge and James Welch and on and on. I’m proud of that history and the way those authors captured sense of place—many of their novels forever shaped my sense of literary tradition. But they are, no surprise, largely written from the perspectives of straight, white men. Even though I was aware of books like A River Runs Through It from an early age, I had never read a novel that captured something like my own youth as a third generation Montanan growing up queer in a dusty ranching town at the end of the twentieth century, a story where 1980s and 1990s pop culture interacts with street dances and rodeos. I didn’t grow up on a ranch or a farm, even though lots of my classmates had families who owned them. I was a latchkey kid obsessed with renting movies and seeking-out coded queer content in a place that still actively romanticized the “cowboy lifestyle.” Cam Post, in part, stakes a claim for queer girls who grew up in small towns in “flyover states.” It says: Hell, yes, we come from here, too, dammit! We’re your neighbors and your children, your siblings and your friends. I grew up on a steady diet of coming-of-age novels that almost exclusively centered on the formative experiences of straight kids, and so I set out to write one that, at least in its early chapters, looked a lot more like my own experience discovering queerness in a virulently hetero-normative culture. Ellyn: A lot of people are not aware that conversion therapy camps still exist and queer kids are still sent away to them. What research did you do about the conversion therapy camps? And what reaction do you get from your readers about them? Emily: That’s certainly one of the reactions I’ve gotten—a bewilderment that conversion therapy exists, in any form, today. Though I also hear from readers who have their own, sometimes terrifying, stories about conversion therapy—or, even more often, the ways in which their religious communities or families have rejected them because of their queerness. Or, happily, sometimes embraced them, too. I first started writing this book thirteen years ago. It sold in 2010 and was published in 2012. And during that years-long process, I was really looking only at what conversion or “reparative” therapy might have looked like within evangelical communities in the early 1990s, when the novel is set—so that helped narrow the scope of my research. Sadly, there is not a single story of conversion therapy. Sometimes it takes place in a licensed—believe it or not—therapist’s office and is primarily “talk” or cognitive therapy; sometimes it’s as part of a camp or church group, like in my novel; sometimes it’s aversion therapy done in some religious leader’s living room—there are many, many stories of what conversion therapy might look like. All of it is pseudo-scientific, wholly unnecessary, and harmful to the person or people receiving it against their will. My research took several forms, from speaking with some survivors of conversion therapy to reading memoirs on the subject. Mel White’s Stranger at the Gate was particularly influential. To watching a documentary about the founding of Exodus International, a once-umbrella organization that provided many resources for practitioners of conversion therapy that thankfully disbanded in 2014 and the early days of conversion therapy in America. To also seeking out primary source material like instructional guides for would-be practitioners of conversion therapy. For instance: the “dorm manual” pamphlet that’s reproduced in my novel takes its language and rhetoric and overall form from a very similar document that was being used at a conversion therapy residential center in Kansas for years. I think it’s really important for readers to understand that God’s Promise (the camp where the novel is set), and its practices and policies, are just one story of conversion therapy and what it might look like. There are literally, and shamefully, hundreds and hundreds of others. I would encourage people looking to read a recent memoir about conversion therapy to seek out Garrard Conley’s beautiful Boy Erased, which has also just been made into a feature film and will be releasing on November 2nd. I also encourage people to check out the podcast UnErased when it also releases on November 2nd. It will tell all about the history of conversion therapy in America. Ellyn: The relationships that Cameron builds at the camp with other queer kids are so important to her own ability to survive it, especially the very powerful ending in the book. What do you think is important about these characters and relationships for Cameron? Emily: Like a lot of queer kids of my generation, and certainly before, I had never even met an out LGBTQIA person until I went away to college. Certainly there were people who were rumored or whispered about in my hometown, and of course there were, statistically, other queer people, but I knew not one single person who was out and proud about being LGBTQIA until I was 18 years old and living on Long Island. And, of course, there was so much less representation of queer lives or identities in our entertainment and media at that time, and what little we did get was largely tokenized or stereotypical. What I knew about trying to live as a queer person was a culture of shame and silence—pervasive silence. It made every difference in the world to me just to meet other queer people and talk to them and hear about their experiences and feel seen and heard in ways I never had before. I knew I was gay by the age of 11 or 12, and by 13 or 14 I didn’t even really question that fact anymore—it wasn’t an internal struggle for me. But I absolutely could not conceive of coming out in my hometown at that time. What I needed was a queer community. I needed other queer people and vocal allies around me. The same is true for Cam Post. God’s Promise offers lots of terrible things, but meeting Jane and Adam are its silver lining for her. Ellyn: This is quite a powerful young adult novel with a queer protagonist. Do you see yourself writing more YA with queer themes, or are you venturing off in other directions for your next novel? Emily: It’s possible that someday I’ll write another YA novel, but my new novel, titled Plain Bad Heroines, is for adults, though certainly older YA readers might also find a lot there to interest them. Plain Bad Heroines is part contemporary and part set in the past in gilded-age Rhode Island, and concerns a cursed girls’ boarding school on the ocean and the three contemporary queer women trying to make a controversial horror movie about it. 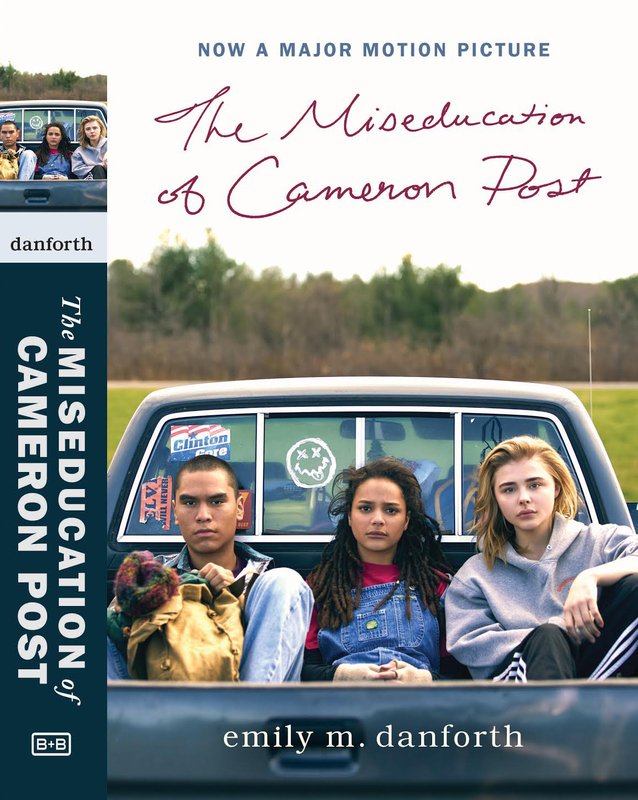 It’s very, very different from The Miseducation of Cameron Post but still very, very queer. I won’t ever write fiction that isn’t explicitly about queer people and queer lives and themes—especially queer women. Even though we’ve certainly made progress when it comes to LGBTQIA representation in our art and entertainment, there’s still a real shortage of stories that show a complex range of queer experiences. Right now, I’m particularly interested in writing fiction that reclaims queer histories that for far too long we’ve been incorrectly told never existed in the first place. Queer people have always been around, finding ways to live our lives even in the most oppressive of societies. Ellyn: It’s exciting that your book has been made into a film. What was that process like? And were you happy with the way the film told the story? Was it hard to cut away a lot of the early story development when the film’s focus was chosen? Emily: It’s so exciting! It still feels unreal to me. What I usually tell people is that the film is very different from the novel AND I love it. Both things are true. I think of the film as a love letter to the heart of the book and not a direct adaptation. Desiree Akhavan, the film’s director and co-writer, read Cam Post when it was still in galleys and sent me a really lovely email about it. 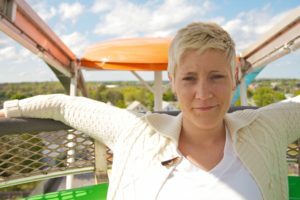 I wrote her right back with my own, as my wife and I were such fans of the queer web-series she was then making and co-starring in, The Slope. We met a few times after that, socially, and stayed in each other’s orbit. After the success of her wonderful first feature film, Appropriate Behavior, Desi reached out again and said that she and her filmmaking—not romantic—partner, Cecilia Frugiuele, were interested in optioning Cam Post. I was absolutely thrilled. It’s so rare to even find a woman director in Hollywood—even in indie-Hollywood—so to have the material end up with a bisexual, Iranian woman director who had been a fan of the book for years felt—and still feels—unbelievably lucky. Over the course of the next year or so I read several versions of the screenplay (it changed significantly over its various drafts), offered notes, skyped with Desi and Cecilia about the project, and even toured Desi around Montana for a couple of whirlwind days while she was scouting potential locations. I knew, from the outset, that they planned to focus on the God’s Promise storyline—which is ultimately the final third of the novel. This was the plan from the very beginning, so I had a lot of time to acclimate to it and get used to the idea that so much of Cam’s story wouldn’t make it onscreen. I think, really, the biggest loss for me isn’t so much that material but the Montana location. I pushed and pushed for them to film in Montana, but it’s a hugely expensive state to get a cast and crew to when none of you are located there, and doesn’t have particularly great tax incentives for doing so. This film was made for just a little over a million dollars—which might seem like a lot but is, even in the world of independent film, a tiny budget. They just couldn’t make Montana work and I’m glad they decided not to “cheat” it and pretend like it’s filmed there because upstate New York, where they did film, just doesn’t look like Montana. During the fall of 2016, I visited set a couple of times and you can even glimpse my wife and me in the rock concert scene if you look close and don’t blink. Everyone involved in making this film was so brilliant and passionate and willing to work for almost nothing to see it through and I’m so grateful to all of them and their talent. I think it’s such a funny, warm, honest film. Seeing it would have absolutely changed my life as a closeted 14-year-old in 1990s Montana. Ellyn: I hear you’ve toured with the film as it was being presented at different film festivals, what was the general reaction from audiences? Did anything surprise you? Emily: It’s been wonderful to watch the film with audiences and talk with them after. I felt particularly lucky to attend several screenings in Montana with Mathew Shurka, a conversion therapy survivor and activist who founded The Born Perfect Campaign to End Conversion Therapy. I don’t know that I’ve been surprised by this, but it has been thrilling to see how many audience members have questions about what they can do to get involved ending conversion therapy in their town or state. One thing that surprises audiences is how much humor is in the film, just how funny and warm it is, despite its serious subject matter. I don’t think it will ever get old for the lights to go down and then to sit in an audience of strangers with people laughing and crying—even sometimes gasping—over the actions of characters I dreamed up so many years ago. It’s a pretty magical experience. 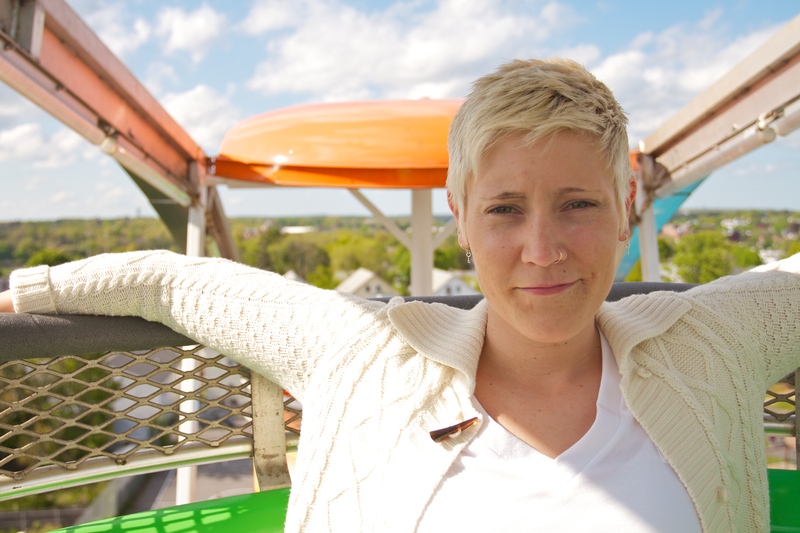 Ellyn Ruthstrom is the Executive Director of SpeakOUT. Posted by admin on Tuesday, October 30, 2018, at 6:36 PM. Filed under Uncategorized. Follow any responses to this post with its comments RSS feed. You can post a comment or trackback from your blog.